K.O. 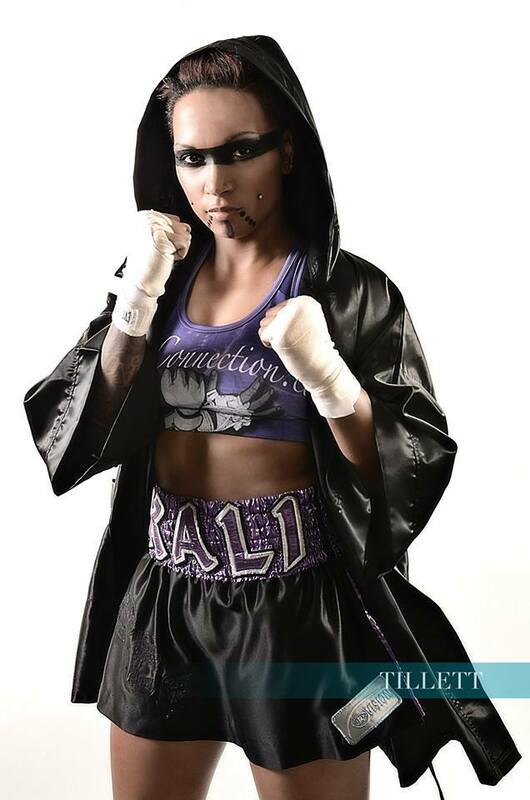 Mequinonoag Reis: Exclusive Q & A Ahead Of Her May 3, 2014 Fight! Kali Reis (5-2-0), known in the ring as K.O. 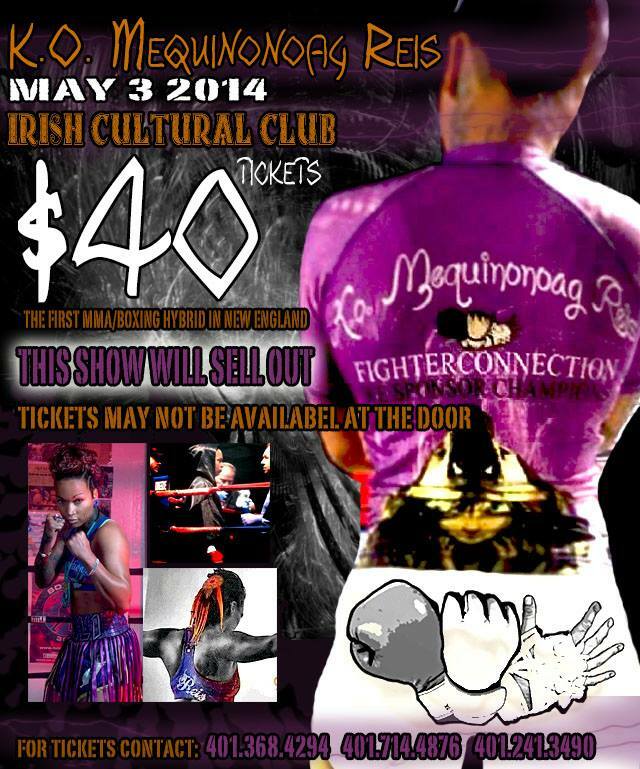 Mequinonoag Reis, will be fighting Marva Dash (0-2) on May 3, 2014 at the Irish Cultural Center in Canton, Massechussetts. Promoted by Big Six Boxing Entertainment, the bout will be on mixed card of boxing and MMA bouts–and the only female fight on the card. Reis defeated Dash by unanimous decision in a previous four-rounder. Kali also had a challenging upbringing in the tougher areas of Providence, Rhode Island, but it didn’t keep her down, and she used her athletic abilities and keen intellect to push through adversity. She started boxing at a young age, learning the rudiments of the game on a heavy bag with her coach, the Native American boxer, Domingo Tall Dog. In her late teens, she trained with Peter Manfredo Sr. and eventually with Dr. Roland Estrada at Big Six Boxing Academy. Reis is currently back in training with Manfredo. Last fall, Reis shocked the boxing world with her high credible showing against seasoned boxer, Tori Nelson, in a ten-round WIBA Welterweight Title fight in Cockeysville, Maryland on November 7, 2013. While Reis lost the fight, she gained respect for her obvious boxing talent, especially since she’d been out of commission following a serious motorcycle accident in 2012. It was also her first 10-rounder. When she isn’t fighting, Reis works as a trainer at the Striking Beauties Boxing Gym for Women in North Attleboro, MA, teaching adults and children how to box. 1. 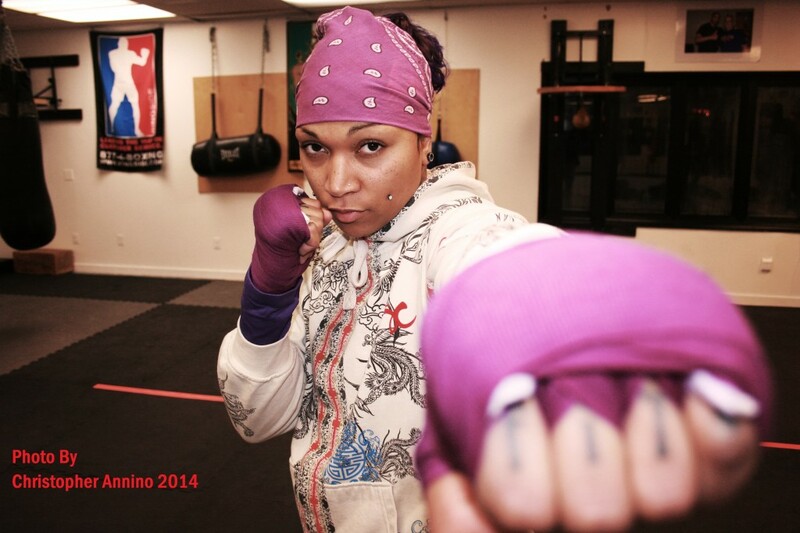 You’ve got a 6-round fight coming up on May 3, 2014 against Marva Dash — what can we expect to see on fight night? You can expect to see a totally different fighter on my end, from the lay time we fought in 2012. I’ve made some serious adjustments to my training camp and the results have proved to be successful thus far. I am very happy with the way I am feeling and looking in the ring. 2. What do you want to tell your fans about your upcoming bout and what motivates you to fight? 3. The 10-round WIBA welterweight title fight last November against Tori Nelson was quite a bold fight for you — especially since it was your first bout after your serious motorcycle accident. What did it take to walk into the ring that night? It took EVERYTHING!! I had been back in training since last July and was scheduled for a come back fight locally in Rhode Island in October. We got the call about the Nelson Title fight about a week after she defeated Alex Lopes for the vacant title in early September and I jumped right on it! It was perfect timing because of the scheduled “tune-up” fight in Oct, but that fight fell thru. So I was going into a 10-round world title fight from over a year lay off. Physically I was in great shape and did what I had to do, mentally I wasn’t all there. Personally I was going thru a few changes and there were a lot of new things for me going into this fight. I had Peter Manfredo back on my corner with Dr. Roland Estrada and I hadn’t had Pete in my corner in years. I had never fought 10 rounds or a main event or in Maryland lol. Not to mention the “ring rust” I didn’t have a chance to shake off prior to this fight. The only mistake I made with that fight is not letting my hands go. I picked it up In the fourth round and every round following but it was a little too late. I want the rematch most definitely. 4. You surprised a lot of fans and boxing aficionados with your ring skills that night — and now you’re ranked number ten at welterweight. Where do you see your career going from here? Are you working towards another title shot? I see nothing but positive moves being made toward that number 1 spot. Especially after the recent positive changes I’ve made. I seem to have finally found my rhythm and I’m focused on doing what ever is necessary to secure my place as a top contender in the female welterweight division. I also have other plans to make some noise in Native Country. I want to (and will) start an all Native cross country boxing tournament. It’s just thoughts and conversation right now but I am determined to make it happen. I do what we as a Nation of people have been doing for centuries, I FIGHT!! Another title shot is in the works right now and hopefully everything goes thru smoothly. 5. You’ve been around boxing for over ten years first as an amateur and now as a pro — what motivates you to keep in the boxing game? My love for the sport. I’m definitely not in it for the money lol. I’m not too bad at it either. I look at boxing as an art and I haven’t mastered that art yet; or in better terms I haven’t achieved what I want to achieve from boxing yet. Boxing is one of those skills were you will never know it all and there’s always something new to learn or an area to improve in. 6. As a proud Native American woman with a rich heritage that includes Cherokee, Nipmunk and Wampanoag ancestry — and one of the few in boxing today — you are a role model for other young women. How has your experience in boxing helped you — and what can your experiences offer by way of guidance to younger women and girls? Boxing has definitely helped me to channel and control certain emotions. It has also given me patience in general because I am also a boxing coach and fitness/boxing instructor for all ages and teaching takes a lot of patience. Boxing is a very demanding sport and it teaches you commitment, discipline and offers a feeling of success as you learn more and more. I always teach my girls/students to be humble to the sport and don’t cheat on yourself by taking the easy way out. Boxing isn’t a team sport so if YOU don’t do something it’s YOUR fault, there’s no one else to blame. 7. With the Olympics in 2012 — and Claressa Shields’ success at bringing home the gold, there was a lot of hope that the sport of women’s boxing would find its way back to the mainstream. Your fight on May 3rd is actually on a mixed card with boxing and MMA — a format that has been used in California as well when Ana Julaton fought on a mixed card. From your perspective, do you think there is reason for optimism? Certainly the coverage is more positive … the question is why aren’t female boxing matches making it to the mainstream in the U. S.? When Claressa Shields brought home that gold I thought for sure women’s boxing would get the push it’s been wiring for but it fizzled out quick and no one made any significant noise about it! I think mixing the MMA with boxing is a smart idea from a promoters standpoint to get more fans on board and back to being classic boxing fans as well as cater to the fight fans who aren’t into the brutality that MMA offers. I think the reason female fights aren’t making it to the mainstream is because the fights that happened to be showcased are the wrong fights. They’re unskilled sloppy “pull your hair” slap fest that no one cares to watch. We need the caliber of fighters like the era of Lucia Rijker, Laila Ali, Christy Martin when fight fans wanted those females on main big name cards. A few tickets are still available for what is anticipated to be a sold-out show. Tickets are $40, $75 Ringside, available through Kali at 401-368-4294.